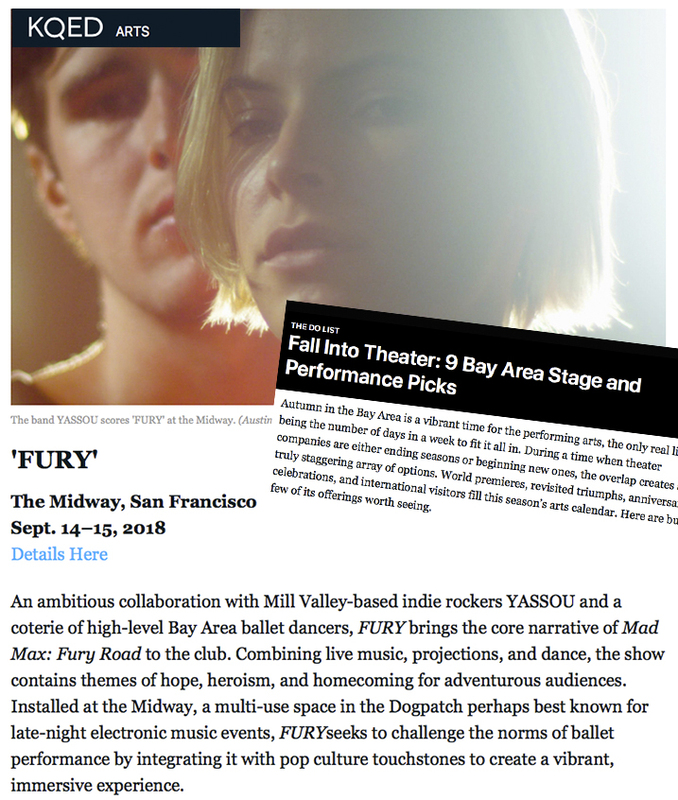 FURY #7 in San Francisco Magazine's Fall Arts Preview! The temperature was in the teens and the snow was piling up in the streets of Ketchum as Dan Drackett greeted Bob Smelick and Jennifer McGrath over lunch at Cristina’s in late January. But the three were too flush with excitement to notice the wintry scene around them. They were looking forward to three days in August when Isabella Boylston is primed to return to her native Sun Valley, bringing some of the top ballet dancers in the world with her. Indeed, The International Ballet could rival the much-heralded full solar eclipse as it offers two very different performances at 6:30 p.m. Aug. 22 and 24 at the Sun Valley Pavilion. One show will feature 10 numbers—a lot for a ballet performance. Tentatively, it’s slated to include works by George Balanchine, Alexei Ratmansky, Christopher Wheeldon, Justin Peck, Pontus Lidberg and, possibly, Trey McIntyre. The other performance will include the premiere of a commissioned piece by American Ballet Theater dancer/choreographer Gemma Bond that was inspired by the full solar eclipse that is taking place over Sun Valley during the festival. Bond’s premiere will feature a score by Judd Greenstein and video designs by Kate Duhamel. “We think people who are very serious about ballet will come to both,” said Drackett, a serious connoisseur of ballet himself, having had two daughters danced their way through prep school and college. Isabella Boylston hopes to feature 22 dancers, many of them principals with other ballet companies. Dancers will include American Ballet Theatre dancers Isabella Boylston, Stella Abrera, Misty Copeland, Marcelo Gomes and James Whiteside, as well as New York City Ballet dancers Tyler Angle, Robert Fairchild and Tiler Peck. Lauren Cuthbertson will represent the Royal Ballet and Maria Kochetkova, the San Francisco Ballet. Ida Praetorius and Alban Lendort will represent the Royal Danish Ballet and there will also be dancers from The Marinsky Ballet. The performances will feature live music from 25 symphony musicians. Dancers will offer free classes for children and master classes on Aug. 23. “My daughter is a dancer and I can’t imagine being 8 years old and told, ‘Oh, by the way, Robbie Fairchild is going to teach a class for you,’” said Smelick, a board member of the San Francisco Ballet. Drackett and Smelick, both board members of the Sun Valley Summer Symphony, invited the San Francisco Ballet—America’s most venerated and longest running ballet company—to perform in Sun Valley the summer of 2012. They raised enough sponsor money that they were able to give some to Higher Ground, Sun Valley Summer Symphony, Footlight Dance Centre and Sun Valley Ballet following the performance. And the performance proved so successful that they immediately vowed to repeat it. Tickets will be available for purchase beginning June 1, 2017. Organizers are also seeking sponsors who might provide the funds to ensure, among other things that dance students and ballet teachers can attend the performance free of charge. Sponsors will be given front-row seats and they will feted at a sponsors dinner party along with the dancers at Dan and Martine Drackett’s Pavilion in Greenhorn Gulch. The 30-year-old Boylston, who is the dance double for Jennifer Lawrence in the upcoming movie “Red Sparrow,” has always wanted to curate a show of her own. And she’s called on her many friends in the world of ballet to join her in this endeavor, said Drackett. Boylston, originally named Hildur Isabella after her Icelandic great-grandmother, seemed destined to become a professional skier since her parents Mike and Cornelia met on a Sun Valley ski lift. But her mother, a Swedish electrical engineer, enrolled her in dance classes at age 3 and she danced her way to become one of America’s premier ballerinas. The New York dancer made her debut in Alexei Ratmansky’s “The Bright Stream,” a spoof of Soviet style ballet, in 2011 while still in ballet corps. By 2014 she was the soloist in “Giselle.” A former artist-in-residence at the Vail International Dance Festival, she’s been praised for the freshness she brings to dance, as well as her athletic abilities and her relaxed demeanor. “She’s a hometown success story, who has risen to the pinnacle internationally,” added McGrath. Most recently, Boylston went to Budapest to be the dance double in “Red Sparrow,” which stars Jennifer Lawrence, Joel Edgerton and Jeremy Irons. The film revolves around a young Russian dancer who’s recruited against her will to participate in an operation against a CIA officer. The dance in the film, set to be released in November 2017, was choreographed by Justin Peck. For more information, visit www.balletsunvalley.com. For inquiries, call 208-727-7437 or email info@balletsunvalley.com.